German manufacturing ﬁrms increasingly engage in service trade activities. 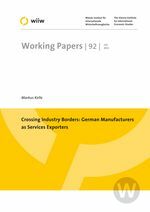 Micro-level data show that producer service exports of German manufacturers amounted to EUR 30 billion in 2005. In particular, construction, engineering and R&D services are exported. The machinery industries and automobile and chemicals producers dominate the overall pattern. The types of services exported vary strongly across industries. Furthermore, export activities are concentrated on a few large exporters. Service exports of advertising, data processing and R&D services are found to likely support foreign affiliates of ﬁrms. However, these headquarter services are only infrequently observable. Much more important are construction and engineering services exported by machinery ﬁrms. These might represent installation and maintenance services exported to complement the supply of machinery. Beyond the support of foreign production affiliates of ﬁrms, R&D services exports generally represent the transfer of knowledge and technology. These might be relevant also in R&D cooperations of ﬁrms or when ﬁrms have partnerships with foreign suppliers or buyers of intermediate products.